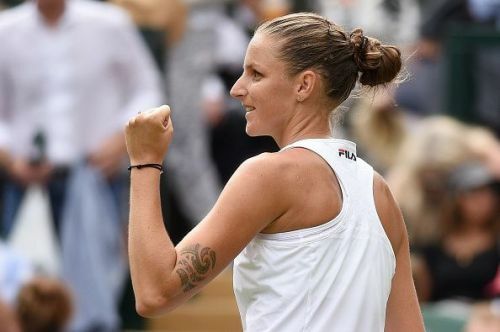 Karolina Pliskova set a new personal best at Wimbledon on Wednesday afternoon. Despite the attempts from Victoria Azarenka to outduel the eighth seed, she let nerves get the best of her in a 6-3, 6-3 straight sets win for the Czech on Centre Court at the All England Tennis Club. It was the first time ever in five straight attempts that Pliskova reached the third round of Wimbledon. A sixth meeting was in the making for the two superstars of the sport meeting for the first time at Wimbledon where the Czech had a one up so far this season. She took a second-round win at Madrid, defeating the Belorussian in a three-setter. So far, the time on grass leaned in favor of Pliskova but had a tough first round, winning in three sets against Harriet Dart. Azarenka’s straight-set win against Ekaterina Alexandrova was the start she wanted but after having her knee taped up, the former number one would have to be careful not to injure herself more. She didn’t have the tape on her knee giving the crowd the indication of her readiness to take on Pliskova’s tactics. The Czech took the opening game on serve and made it hard for Azarenka to do the same. She saved her serve to deuce but needed four breaks to get even. She was down on serve for the second time but couldn’t hold it handing Pliskova the first break and a 3-1 lead. Azarenka fought to get her serve back in control but was still down two games to the world number eight. After another successful hold, Pliskova played for the set in the eighth but was denied any points, giving Azarenka her first serve to love. The Czech answered back with a well-held service game that gave her the set on a cross-court winning ending 40 minutes. Both serves were in fine form with the second doing much better than her first. She landed less unforced errors than Azarenka who struggled on the second serve at 43%. She brushed off the idea of being a set down and came out all guns blazing to start the second set. After holding Pliskova on her opening serve, the former number one went for the serve to love in the third blanking the Czech indicating her improvements on the first serve. They went to six together before the nerves got to the 28-year-old who faltered on serve, giving Pliskova the lead needed. She held in the eighth sitting one game from the match with Azarenka in danger of exiting the tournament. She recorded the first double fault from either player in the match showing her that her emotions were getting out of hand. A second one became too much as she erred on her third try to get it across before it was all over on a long ball that concluded 72 minutes. She won’t see the path get easier as she takes on Mihaela Buzarnescu who has been on quite a run prior to Wimbledon showing strength on the grass courts.